Award recitals are such fun. We get to see and hear the young singers we know and love; we get to witness the fruits of their long years of study; we get to participate in honoring them. All award recitals are fun but the George London Foundation Awards Recital offers something special. The judging takes place at the end of the competition whilst we wait outside the hall at the Morgan Library and Museum. The finalists are there with us so we have the opportunity to speak with them about their selections, their preparations, their anxiety (or lack of), their training, even their gowns. What a generous history has the George London Foundation! And an even greater present since the ante was upped this year. 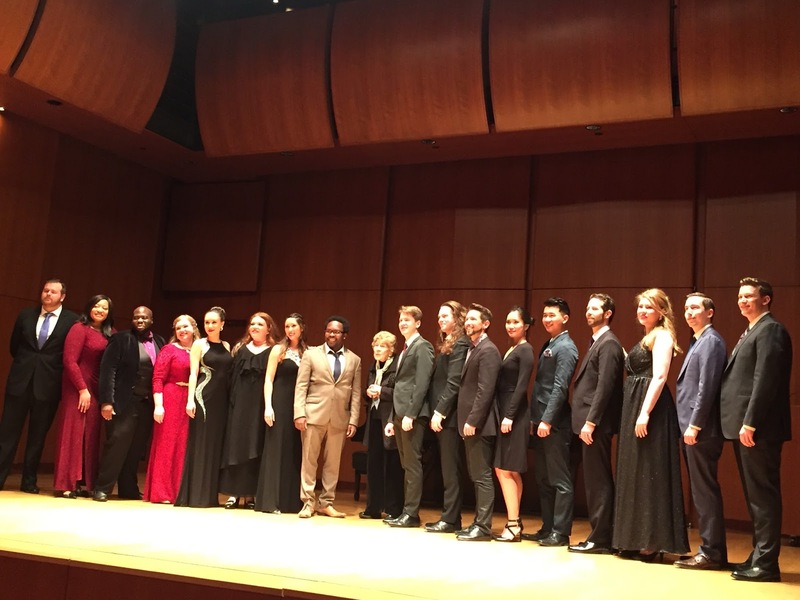 $75,000 in prizes was awarded to the 18 singers. Every single finalist received an award. In our eyes as well, they were all winners. About half of them are known to us from prior recitals and competitions and the other half will, we hope, perform in New York City so that we can hear them again. We have written every year about the foundation and the role of Nora London in perpetuating the memory of her husband, the famous George London. What better way to honor someone than to pass the torch. As is our wont, we will not tell you the size of anyone's award, information you can find on the Foundation's website. We are more interested in the quality of the performance. Often, we agreed with the decisions of the judges; when we did not, we are prepared to admit that they recognized a quality or a promise that we missed. We surely agreed with them about soprano Michelle Bradley who gave an electrifying performance of "D'amor sull ali rosee" from Verdi's Il Trovatore. Here is a true Verdian voice with an expansive top and plenty of strength in the lower register. We loved the variety of color and dynamics and the lavish expressiveness. Bass-baritone Cody Quattlebaum impressed us with the devilish demeanor with which he invested Mefistofele in "Vous qui faites l'endormie" from Gounod's Faust. The lovely French lines were punctuated with mocking laughter. Sympathy for the Devil indeed! Aaron Blake's sweet tenor drew us into Edgardo's suffering in "Tombe degli avi miei" from Donizetti's Lucia di Lammermoor. The resonance was just right for the character and the portrayal was more than usually affecting. We felt his pain. Some of the choices of arias seemed a bit strange to us but, as we learned, the judges selected from the artists' lists the one they wanted to hear. We observed an emphasis on 20th c. works, some of which we had never heard, some of which we had heard and disliked, and one which we actually had enjoyed at Juilliard. In any case, one can love the singer and not love the song! For example, baritone Shea Owens did a beautiful job with "Batter my Heart" from John Adams' Doctor Atomic. We truly loathed the opera BUT Mr. Owens made the aria meaningful and intense. Happily he made every word count. Another example--we don't think we could sit through hours of Alban Berg, but Lara Secord-Haid gave a stunning and expressive performance of "Lied der Lulu" with its jagged vocal lines. Her German was enviable and crisp. A couple works by Benjamin Britten put in an appearance. A most convincing performance of the "Mad Scene" from Peter Grimes was given by tenor Kyle van Schoonhoven. There aren't too many mad scenes for men in the operatic canon; this one is a doozy. We believed every word of it. Although it is more difficult to evaluate someone's voice in a piece like this, the artist was totally immersed in the dramatic intent. "I know a bank" from Britten's A Midsummer Night's Dream was performed by countertenor Daniel Moody, who made the aria live with some superb acting, word coloration, and apt dynamic variation. He succeeded in creating an otherworldly character. We do love countertenors and there were two of them. Aryeh Nussbaum Cohen performed "Dawn, still darkness" from Jonathan Dove's Flight. Having seen the opera recently at Juilliard (and enjoyed it) we were able to put the work in context and understand why the character was feeling such pain--pain that Mr. Cohen conveyed successfully. Baritone Brian Vu sang Onegin's response to Tatiana's letter and he sang it in excellent Russian, an opinion we got from our Russian speaking companion. His voice has a lovely quality and he employed gentler colors than customary to create a kinder more avuncular Onegin, an interpretation with which we are comfortable. We never think of Onegin as a heel, but rather as a Dutch Uncle. Tchaikovsky surely gave him some wonderful music to sing. More Russian was on hand from Rimsky-Korsakov. Baritone Will Liverman has a substantial sound that seemed just right for "Grigory's Aria" from The Tsar's Bride. We were even treated to some Wagner as tenor Errin Duane Brooks sang "Siegmund heiss ich" from our favorite part of The Ring Cycle when Siegmund pulls his father's sword out of the ash tree in Hunding's hut. This always gives us goosebumps. A tenor of a different type, Jonas Hacker sang "Salut demeure chaste et pure" from Faust--and he sang it in excellent French with a nice easy delivery. It was great to hear someone sing it without any straining. We witnessed a high quality of singing in several women. Andrea Nunez generated a lot of coloratura excitement in "No, no, I'll take no less" from Handel's Semele. Her upper range was so scintillating we kept thinking "Queen of the Night". Soprano Danielle Beckvermit sang "Depuis le jour" from Charpentier's Louise. We liked her French and the attractive resonance of her voice which has a nice bloom in the upper register. Mezzo-soprano Megan Marino sang "Connais-tu le pays" from Ambroise Thomas' Mignon, another iteration of Goethe's Wilhelm Meisters Lehrjahre. I liked the pronounced vibrato which lent additional sympathy to a sympathetic character. Soprano Lauren Margison sang one of our favorite Mozart arias--"Porgi amor" from Le nozze di Figaro. This one is a real heartbreaker! Mezzo-soprano Carolyn Sproule invested Charlotte's "Air des lettres" from Massenet's Werther with a great deal of emotional power. Her French was quite good. Good English is even more difficult to find but mezzo-soprano Evanna Lai made every word understandable in "Things change Jo" from Mark Adamo's Little Women. It was a persuasive and lovely performance. We heard 18 singers in two hours and enjoyed them all. We hope that the awards will further their careers so we can hear more of them.